This J.Crew top! I am obsessed. It is pretty much the same top as the floral one that I wore a few weeks ago just a different pattern, obviously. For some reason I just feel so comfortable in this top and I just love the way that it fits me. I am seriously headed to Nordstrom today to pick up these jeans that are now on sale. I tried them on a few weeks ago and loved them and I am regretting not getting them. Can we talk about how amazing these earrings are from Purple Peridot and the fact that they are only $15! Such a good deal. I am actually shocked at how inexpensive they are because they are such good quality. I can't stop wearing them. Thanks so much for stopping by. Don't forget to enter yesterdays Graphic Image giveaway. What a surprise to see a photo of you without sunnies on ;-) Good surprise though. Love this casual look! That Purple Peridot necklace is gorgeous! I finally bought it and I'm so glad that I did! It goes with everything! That is such a great top. I can think of so many things to pair it with! This is one of my favorite casual outfits of yours- love it!! Perfect top and earrings! You always look so glamorous! The whole look is so pretty. I love the jewelry and top together. I love your top and heels! I love this outfit! That shirt is amazing! Love this top! Do you have to wear a strapless bra with it? Love this blouse, such a pretty pattern! Did you have that top altered/taken in at the waist? I remember this shirt being so much more 'boxy'. Where is your gold double band ring from? It is darling! 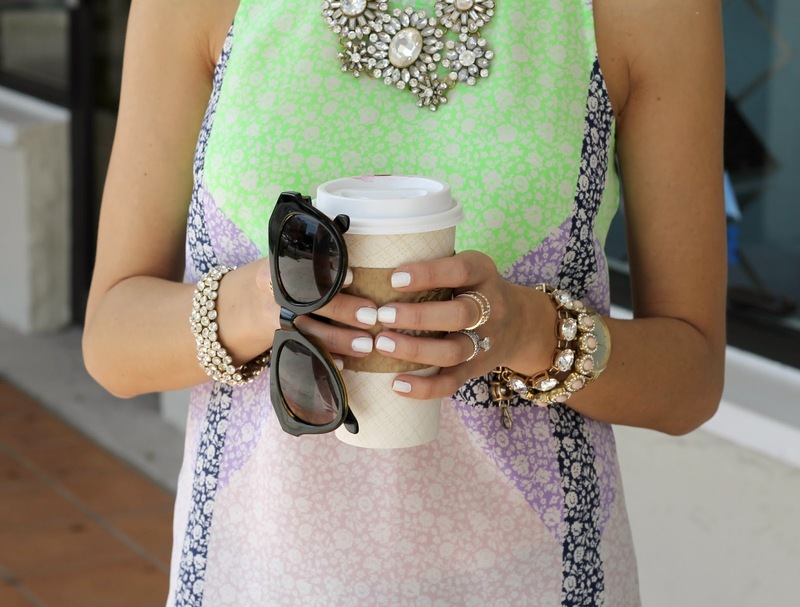 Gorgeous top and jewelry! I love your blog and am following you on Bloglovin'! :) Please check my blog out too! Loving this top!!! I was on the fence when I saw it at J.Crew. You definitely gave it life!!! Very pretty. I'm officially in love with your white Tory Burch bag. So cute!!! where did you get that bracelet in the last photo? i've been looking for something like that for my wedding!! Thanks :) Love your blog. Love those shoes! I have to try and find some over here in the UK! Gorgeous as always!! Love, love, love the top!! Strong geometric lines but in soft colours = win! !